The N-TRON(TM)(distributed in Australia by PowerCorp ) 302MC media converter changes 10/100BaseTX to 100BaseFX Ethernet. The converter is designed to meet industrial communications requirements while providing high throughput and minimum downtime. It is encased in a rugged industrialised enclosure that extends the environmental range including maximum operating temperature to 70°C (158°F). It is housed in a compact DIN-Rail system with redundant power inputs. As an alternative, the product can also be panel mounted. 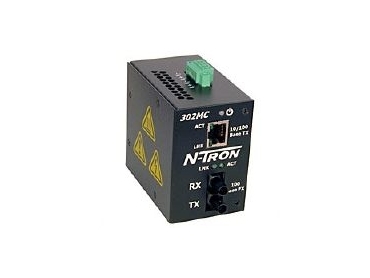 The converters are fully IEEE 802.3 compliant and feature simple plug and play operation. Unlike its commercial counterparts, the 302MC has the appropriate safety certifications for Industrial environments. The 302MC is a 2 port Ethernet switch that functions as a media converter. It includes 1 RJ-45 port that supports full or half duplex operation. Speed and flow control are automatically negotiated. This auto negotiating capability will protect the wiring and media converter investment as plants and equipment are upgraded from 10 to 100 Mbs. The switch will simply scale up and down automatically to match the specific network environment. The second port is an industry standard 100BaseFX ST connection that supports full or half duplex operation. The 302MC can be ordered with optional N-View™ support for remote monitoring using OPC Technology. N-VIEW OLE for Process Control (OPC) Server Software can be combined with the popular HMI software packages to add network traffic monitoring, trending and alarming to any application using N-TRON switches configured with the N-View option.